Good morning from the back yard people. How goes it? Spent yesterday toiling away getting odds and ends completed, and with household stuff. I'm going to be gone quite a few days, need to have things in order you know? The mornings have been cool, and I've loved that. I mean super loved it. 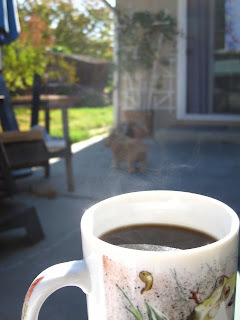 These are classic coffee out back mornings. 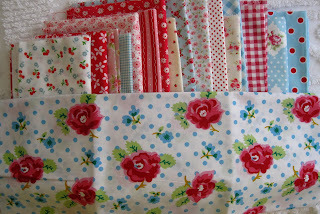 Oh...I need every one of those fabrics...or the bag...or both...so wonderful!!! And this is all from your stash? I'm impressed...and jealous! Now that's going to be a fun bag, Pam! We'll be on the road the same time you and Elizabeth are - maybe we can swap road stories on our Netbooks! Is Binny's stroller packed yet? I love your bags you have made and the fabric is gorgeous! I love all of the colors you have used for each bag. It does seem like lately a lot of your posts are from the back yard. I can't do that in the morning. This morning it was 34 degrees in my backyard, yikes. Looking forward to the warmer Houston weather. See you there. Oooh, those fabrics are gorgeous! What's that print on the top -- I LOVe those colors! Nearly gonna see you again!!!! I cant believe it is 4 sleeps until we board that plane!!!! eeeeek! Everything is looking stunning! I'm going to market..I hope to see you there!!! always unique, always "the apple" in no matter what kind of text: press release, advertisement or regular mail-sending. is interesting. Qualitatively. Thank you very much.